Time is very strong. 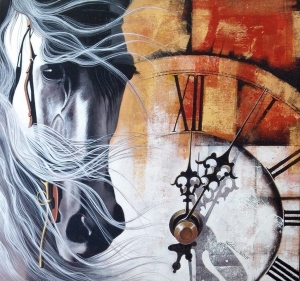 The artist has drawn the similarity to a horse for the same implying that time is as strong as a horse. 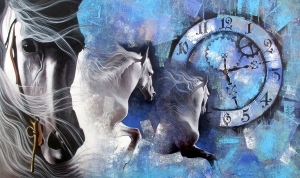 Time takes a step of a moment, a single step like a step in the game of chess and that momentary drop in the ocean of time can change the whole course. That one step can not be taken back. It is like a cascading effect or domino effect which sets off a chain unstoppable and irretrievable.